15 East | I dream of having one hollow leg. For those who don’t know, my hometown of Edmonton is a mid-size city on the Canadian prairies. A landscape composed of malls (strip and freestanding), evergreen trees, and a river. Because for all intents and purposes, Edmonton is landlocked and often (too) proud of being a big, small town, sushi’s popularity was slow to pick up speed initially. When it did, however, that on offer at all those mall food courts definitely helped the taste for it grow. I guess like in most places, the strategy for eating sushi in Edmonton was to determine who could do the best with the fish available and always go there unless somebody better came along. In Edmonton, it somehow felt more important because the good places didn’t come around very often. Thus, when I lived there, it was very much a place where you had only one solid choice for every restaurant category. Vancouver, on the other hand, was sushi paradise. It was literally on every corner. Even when it was bad, it still wasn’t supermarket or mall food court bad. And when you found your good, solid places—maybe something for a work takeout lunch, a sit-down work lunch, home takeout, and somewhere to go with friends—you stuck with them not because something better wasn’t on the horizon, but because it was just easier to stick with the good you knew. Especially because your places would be affordable. Sushi didn’t have to be a treat in Vancouver (although it could be if money allowed); it was the fallback choice. Those were the days. I was actually shocked at how mediocre the sushi in New York was when I moved here. Don’t get me wrong, New York has some incredible sushi restaurants. But those are the places where you’re paying at least $100 per person. 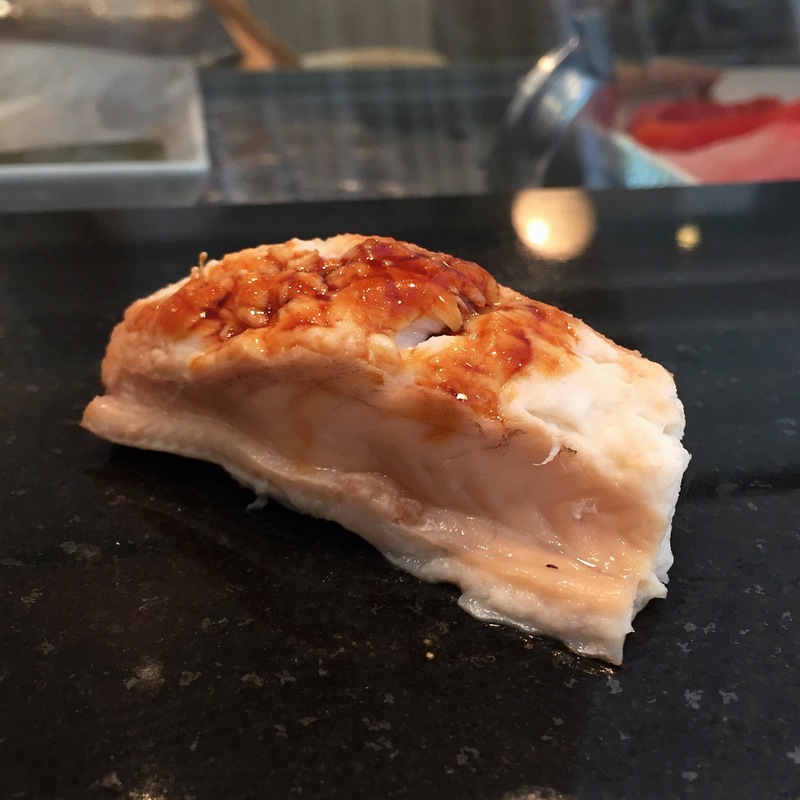 Finding a reasonably priced, acceptable quality place that could be a standard near work or home in the sub-$20-for-takeout region was not easy. Prices were almost double what I was paying in Vancouver for certain items. And the rice. Oh, New York sushi rice can be horrible. Good rice can go a long way in dressing up okay fish, but mushy, overly wet rice can make anything in its vicinity taste rotten. Sure, I’ve found some places that satisfy without wreaking havoc on my wallet. But, just barely, and when I really have a craving, I try to take advantage of the lunch deals at the nice-nice places. The dinner prices scream expense account, and I don’t have one of those. I’ve relied on Sushi Yasuda’s five pieces of sushi + one roll lunch combination for this purpose. But with a summer Friday on my calendar, I decided to try 15 East. I always prefer to be distracted while eating. Reading, watching, talking. I don’t shovel my food, but especially when alone, I like to keep my mind occupied along with my stomach. Except, I’ve learned, when I’m at a nice sushi bar. With only one other diner at 15 East’s bar, which seats maybe 10 people, there was no need to do anything but quietly watch and wait as the sushi chef prepared each of my seven (then eight, then a roll) pieces of sushi (Chef’s choice). There was recently a change in the head chef, but I don’t know if the quality has changed. The replacement who stood in front of me and prepped my lunch did not have me questioning all the praise the restaurant has previously received. 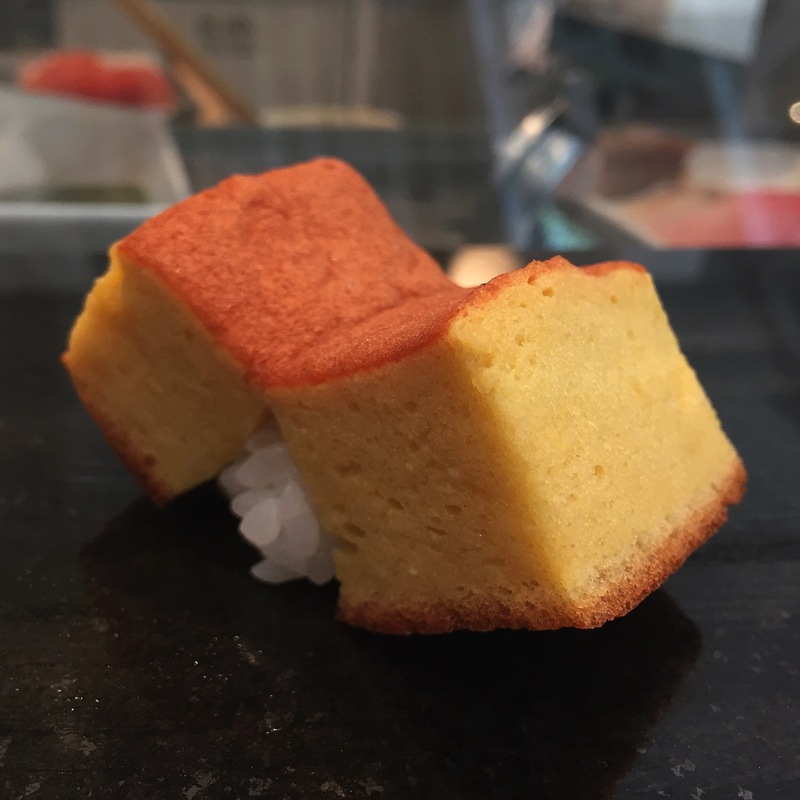 His role: The slicing of the fish, the quick rolling of the rice, the chosen embellishment or brushstroke of soy, wiping the marble serving bar, the placement in front of me. Mine: “Thank you,” into my mouth, quick rub of the finger towel. Repeat. 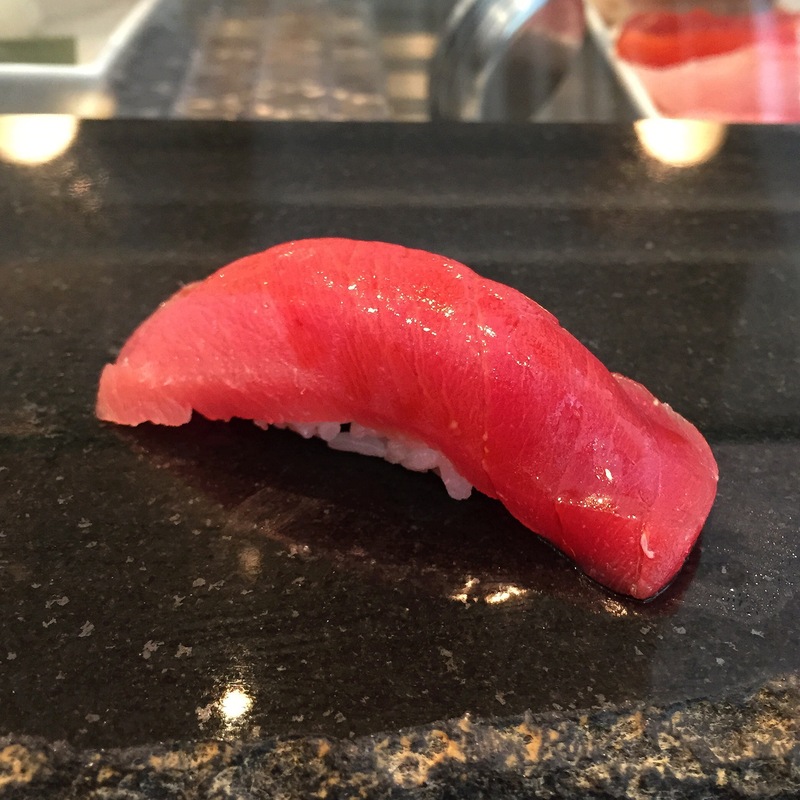 Variation: Sea perch, striped jack, horse mackerel, Bluefin lean tuna, medium fatty tuna, sea urchin, sea eel. The only thing that prevented this from being a swift 15-minute lunch was accepting the offer for more, and adding a piece of tamago and a salmon skin roll (I miss the B.C. rolls of Vancouver…). The fish was perfect, the rice was perfect. There was no time to read or watch others. Definitely a Serenity Now moment. I know that paying [$35 (7 pieces) + $5 (tamago) + $6 (roll) + tip =] $60 for lunch isn’t exactly affordable. But for a place like 15 East, it’s almost a bargain. Especially when 10 pieces at dinner will run you $60 alone. 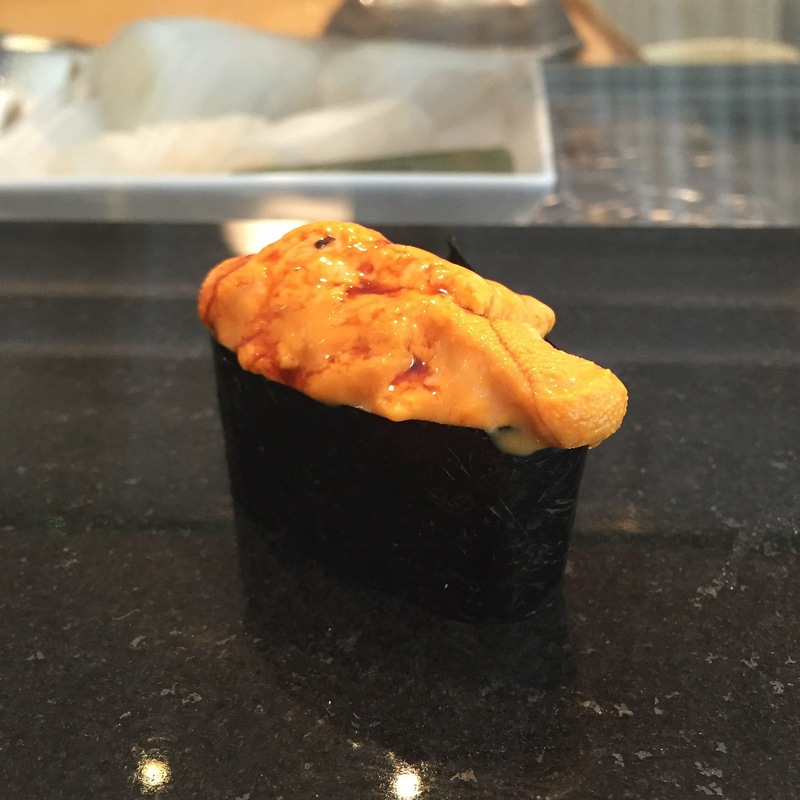 And I quickly learned that the Chef’s Choice served at the sushi bar is a more interesting mix than the seven-piece Chef’s Choice I saw being plated for those who were sitting in the dining room. No one out there got uni, for instance. And the dining room plate was prepped almost entirely by the second-in-command. I don’t always like eating at a bar, but when it means I get the Captain, yes, please. This entry was posted in Eating Out: NYC on August 5, 2015 by historicalartfox. This has put a fierce desire in me for sushi that I most certainly cannot fulfill in small town Ireland!